But no matter how much you coddle donated organs–and Jennifer has treated hers with all the care you’d afford a vintage Aston Martin–organ transplants don’t last forever. Jen is now officially in kidney failure again. Following a battery of tests as intensive as those an astronaut might undergo before being sent to the moon, Jennifer has been approved for a second kidney transplant. It’s a strange process whereby you have to prove you’re in dire need of an organ, but in excellent shape in every other way. Doctors want to be sure each transplant is going to a good home, to someone who will take terrific care of it, and of themselves. The problem? The waiting list for a kidney is four to five years–and Jennifer needs one now. Her life depends on it, and in many ways, so do the lives of those people who love her. She’s a terrific mother, a wife whose husband adores her, and an only child. She’s also one of the kindest, most generous women you’d ever hope to meet. 22 people die every day waiting for transplants in the US alone because of the shortage of donated organs, according to Organdonor.gov. That might not seem like a huge number, but even one death is too many when you consider how easy it would be to save that life if there were more donors. 1. You can be a living donor. This is Jennifer’s best bet! PLEASE NOTE: Leanne Whitehead, the Living Donor Transplant Coordinator at Piedmont Hospital, is on vacation through February 24, 2016, but Megan Parker at Piedmont is handling all queries relating to match testing for potential kidney donors while Leanne is away. You can reach Megan at 404-605-2950. 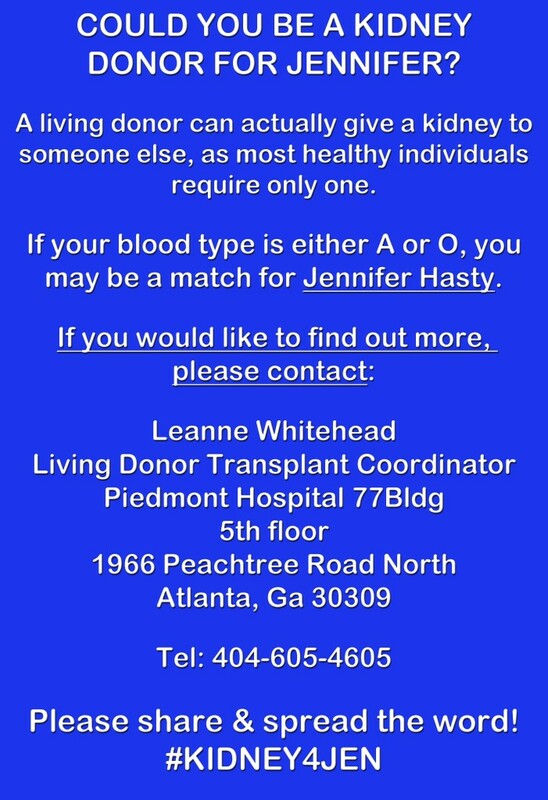 Also, if you are considering becoming a living donor for Jennifer Hasty, her health insurance would pay for the cost of the test to see if you’re a match, as well as for the transplant operation. 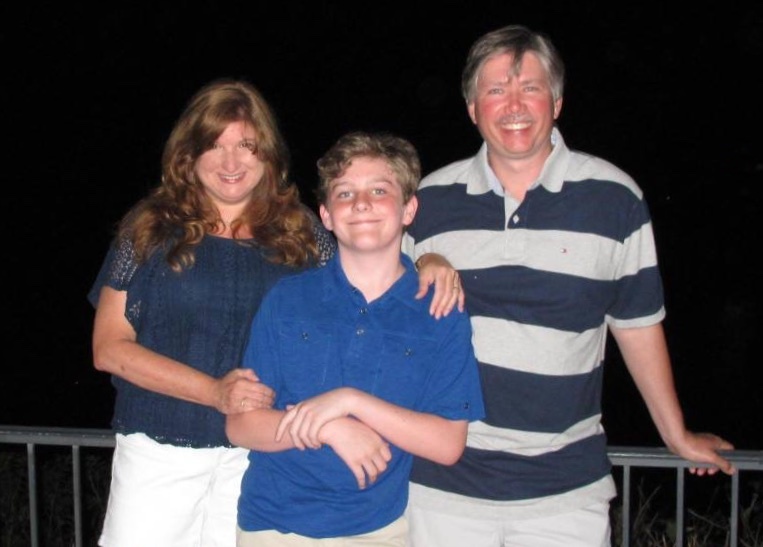 To learn more about how it feels to save a life, read Michael Bobich’s story about how he became a living kidney donor here. 2. Join the organ donor registry to donate your organs after you shuffle off this mortal coil. Maybe you won’t be the one to save Jennifer, but without a doubt, you will save someone. Please share this information with others. I’ve created the hashtag #KIDNEY4JEN and a Facebook page to help spread the word. The best gift you could ever give anyone is the gift of life, and it won’t cost you a cent. Through your efforts, I hope we will not only find an organ donor for Jennifer, but for thousands of others, as well. From the bottom of my heart, I thank you. Didn’t know any of this until now. The only thing I can do is share the post and hope that it has some effect. Stay strong and keep praying. Thank you, Joe! I know how much Jennifer appreciates everyone’s prayers and support. If you can share this post with the hashtag #KIDNEY4JEN on Facebook or any other social media sites on which you’re active, you can spread the word. We can help make this happen for her! I love Jennifer and wanted to be tested but I’m to old, she and l laughed out loud that day. I know her though our church. Praying that everyone that has her blood type gets tested. Praying here in Georgia. BE TESTED!!!! Hi Gayle. Thanks so much for your note. I spoke with Jennifer just yesterday, and she was the usual bubbly Jen, more concerned about those around her than herself and counting her blessings, as always. If you could just share this post with others on Facebook or any other social media outlets where you’re active, that would be terrific. I believe we WILL find a #KIDNEY4JEN, and hopefully help raise awareness about the shortage of organ donors in the process. Many, many thanks! Hi Jennie. First of all, BLESS YOU for considering donating to Jen! I am moved beyond words. I also really appreciate the updated contact information. I’ll note this on my website post, as well as on the Facebook page I created for Jennifer: https://www.facebook.com/Kidney4Jen. Many, many thanks, Jennie.